If you’ve read many of the posts here, you know I like cartograms, maps that encode information by distorting the size of geographic regions. The last few years have seen an explosion of digital mapping on the web, but for some reason the cartogram has been largely left out. And it’s too bad because in many cases they are a far superior way of representing information than maps that use only color. Another one I would put into the category of under-appreciated maps are flow maps, which visualize information by varying the width of lines. Like cartograms, flow maps are by far the best way of communicating certain types of information. And also like cartograms, they can be very visually striking. One beautifully done recent example is the Roads to Rome project, which you should definitely check out if you have not yet seen it. Here are a few flow maps I’ve put together, which show the traffic flow across the highway systems of the U.S. and Europe. Click the image to view the map in higher resolution. 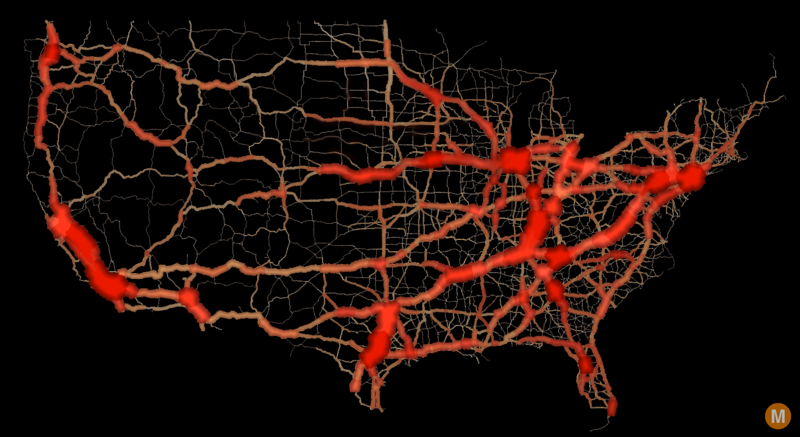 This map shows the U.S. national highway system. The width of each line segment represents that road’s average daily freight tonnage (not precisely the amount of traffic). 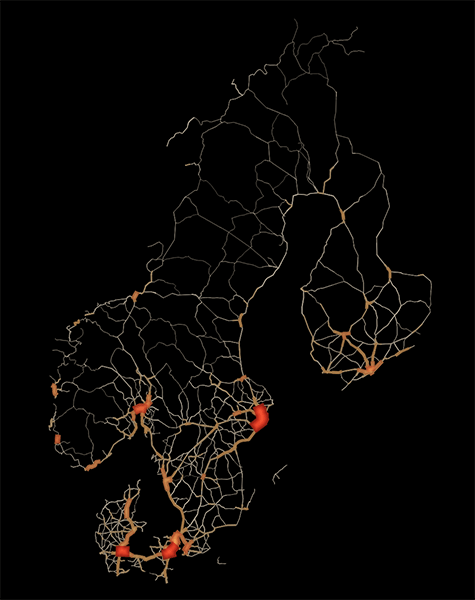 Just as you would expect, most of the big traffic flows are those between the country’s largest cities. The section that first jumped out at me is the three-way connection between New York, Chicago, and Dallas. The point in the middle where the three roads meet is Nashville. Below are the highway systems of Alaska and Hawaii. Unlike the U.S. map, what’s shown here is average annual daily traffic (AADT), the number of vehicles that travel through each section of road on an average day. 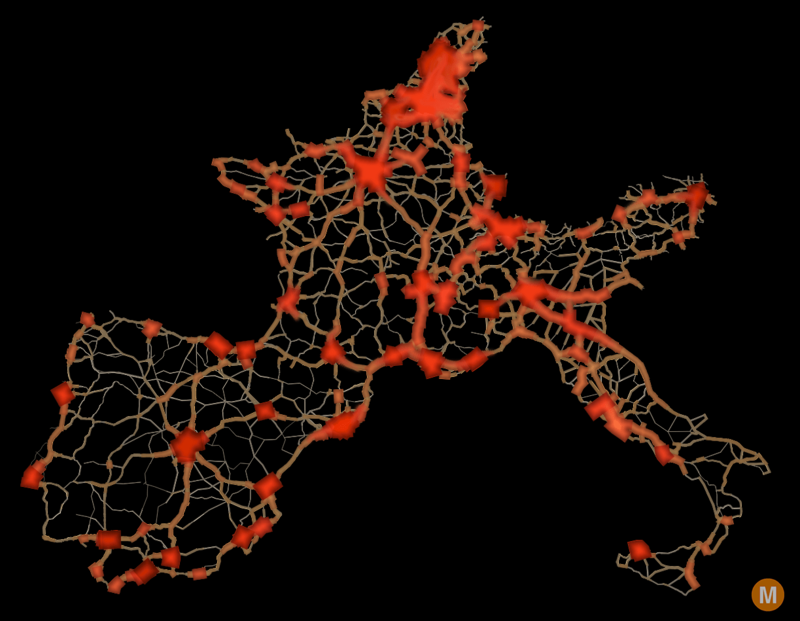 What I found most noticeable about western Europe is the number of dense nodes spread throughout the region. It mirrors the way Europe’s population is distributed. 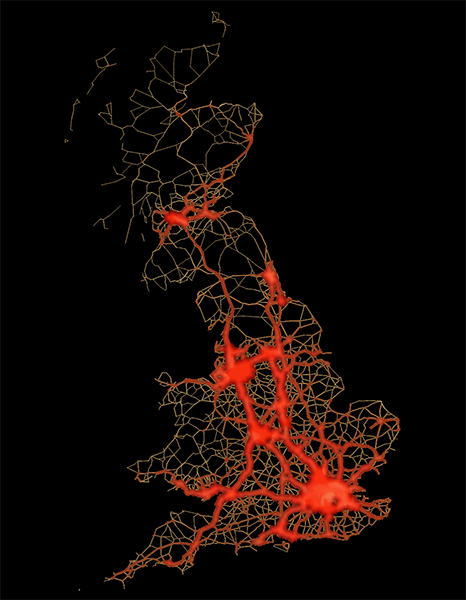 Not surprisingly, Great Britain’s biggest traffic flows are either within London or in and out of London. Let me know if you know of any good flow maps out there, or any good methods for making them. I made these using QGIS, but it required some work in Photoshop to smooth out the transitions between fat lines and skinny lines. If you are aware of a tool / plugin that can vary the width of lines smoothly, I’d love to know. United States traffic data comes from the Department of Transportation’s National Transportation Atlas. European traffic data is from the United Nations Economic Commission for Europe (UNECE) E-Road Traffic Census. The data for Great Britain comes from the U.K. Department for Transportation traffic counts. Very nice flow maps! Great article. Can you point me in the right direction of how to use QGIS and the traffic .csv data. As a new user to QGIS I found this to be quite a complicated task. Thank you! Most of the difficult parts come down to understanding how “joins” work. If you want to learn GIS, that’s where I would start. Alright, thank you for the link(very useful). So you used Open Streets Map data for querying the roads and then you joined that with the traffic .csv file, right?